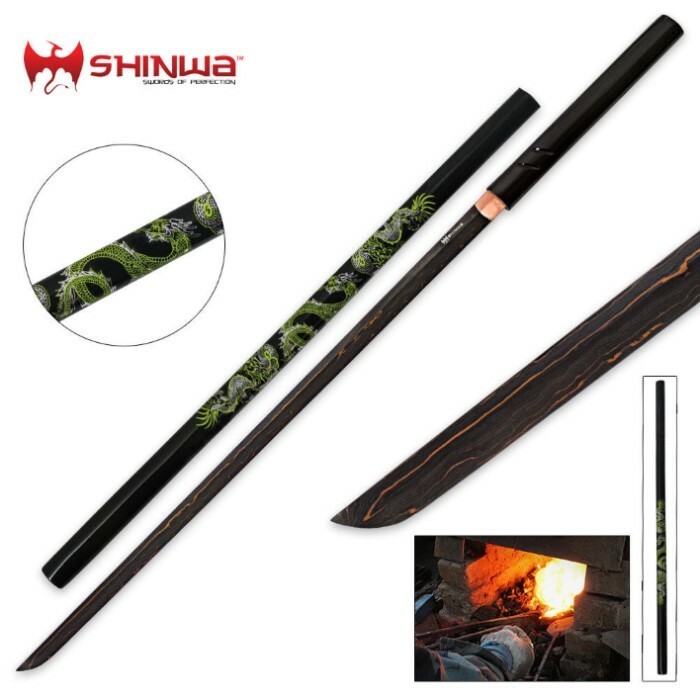 Shinwa Green Dragon Black Damascus Shirasaya Sword | BUDK.com - Knives & Swords At The Lowest Prices! 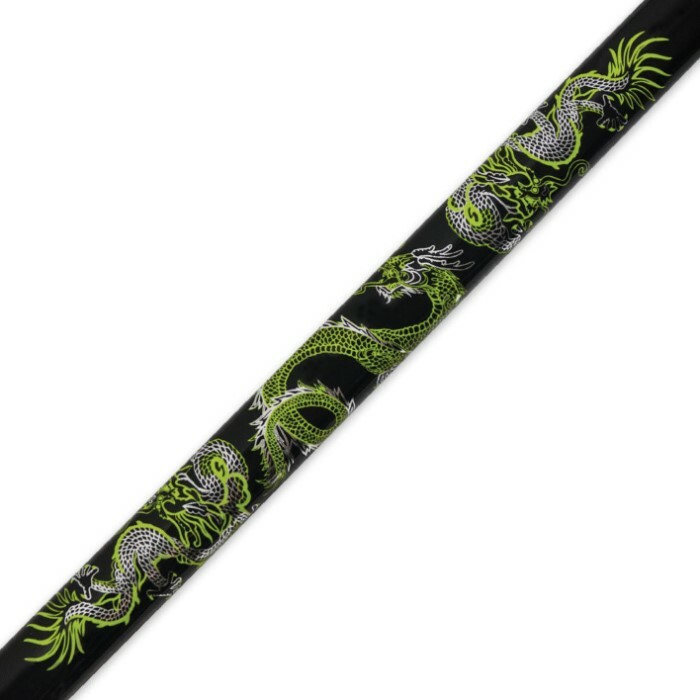 Add some Eastern flair to your sword collection with this exquisitely well designed Green Dragon Black Damascus Shirasaya Sword from Shinwa. The hefty 29" blade is forged of powerful Damascus steel with unique and striking blade patterns, each one with a one-of-a-kind look and feel. 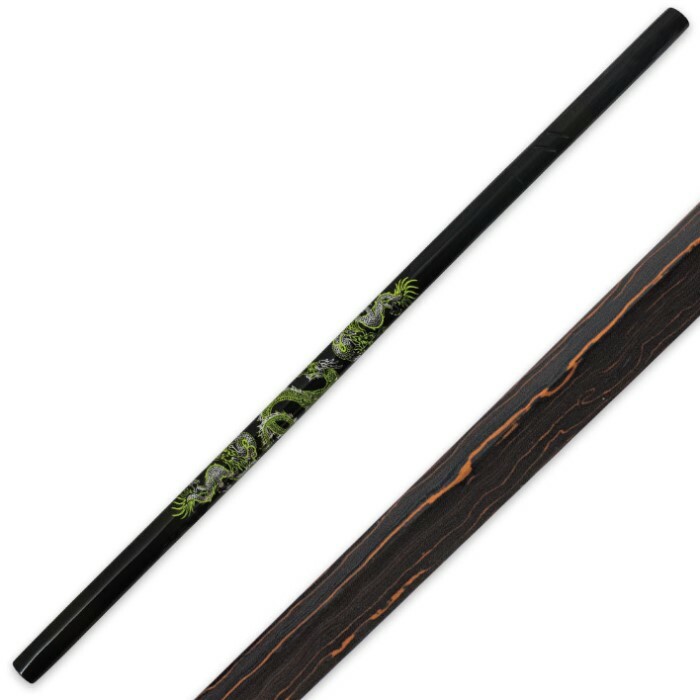 The smooth hardwood handle is hand painted with black lacquer for a truly custom appearance. The lacquered hardwood scabbard features an eye-catching green dragon motif, giving this Shirasaya tons of flare. It is presented with a lined storage box. At 40" overall, this Shinwa Green Dragon Black Damascus Odachi will turn many heads. It's a nice looking piece. There was some minor damage to mine, looked like i wasn't the first owner. A few small scratches and dents on the sheath and the very tip of the blade was bent like it had been dropped on a hard surface. After a little repair work on the tip it's nice and sharp again, but it's very loose in the sheath and rattles alot. Something else i fixed myself. Now, damage aside, it was fairly sharp and the blade has a very nice pattern. It is not very well balanced though. Between that and the description not specifying, I'm fairly certain it's not full tang. Overall it's a nice LOOKING sword but for the price, I'd suggest just getting a musashi or masahiro. Can get far better quality for about the same price. This is a beautiful, light weight fast and functional sword, a must have for any collector.